Heat oven to 375 degrees. Lightly spray or oil 12 muffin cups. 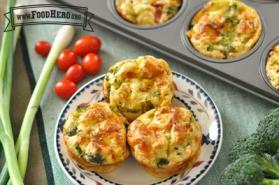 Sprinkle cheese, onions, broccoli and tomatoes in muffin cups. Place remaining ingredients in a bowl and beat until smooth. Pour egg mixture over other ingredients in muffin cups. Bake until golden brown or until knife inserted in center comes out clean, 35-40 minutes. Cool 5 minutes.